Layla is one of the academy’s individual athletes [swimming] who is performing extremely well at National [ Pacific Games] and State [Victorian Age Championships] Competitions. 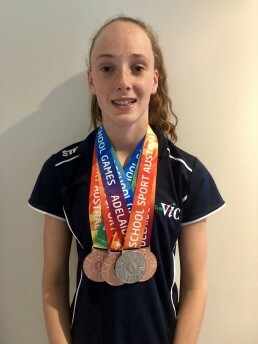 At the Pacific Games she won one silver and three bronze medals and at the Victorian Age Championships last week in Melbourne she won three silvers and two bronze medals. Layla now has five qualifying times for the National Age Championships which will be held in Sydney [March 2018] as well as two qualifying times for the Open Commonwealth Games Trials in February 2018. Layla’s dedication to her sport and of course all of the hard work that she puts in has enabled her to achieve this success. As an individual athlete Layla is one of our elite strength and conditioning athletes who work with the La Trobe University Exercise Physiology students. The support of La Trobe University in this program has been enormous. We look forward to following Layla’s swimming career.